Like the salmon, we have come full circle. We live on Camano Island! I have an exciting new job as the children’s librarian at the Stanwood Library. People in Stanwood and on Camano Island are welcoming and neighborly. It feels like a community where we can put down deep roots. We miss our family and friends in the Southwest. We’re glad to be closer to our family and friends in the Northwest. We’re counting on much visiting back and forth. We are still unpacking and getting settled. There is so much to do. And we do have to stop occasionally to take deep cold breaths of tangy sea air, to pinch ourselves and look around wonderingly. Is it true? Can we really be here? This monumental cedar sculpture (pictured above) was made by Fidalgo Island artist Tracy Powell to honor the Samish people and their traditions. It tells the story of The Woman Who Married the Sea. One side shows a human woman; the other side depicts her transformation into a mermaid whose skin is encrusted with chitons and whose hair has undergone a sea change into flowing strands of kelp. The pole stands on the isthmus dividing Sharpe Cove from Rosario Beach on Fidalgo Island in Washington state. I have known of its existence for a long time, but never had the chance to track it down until the other day. Thank you, Stuart, for 21 years of adventure, invention, and romance. At last! The chapter I authored three years ago for the book, Tribal Libraries, Archives, and Museums: Preserving Our Language, Memory, and Lifeways, edited by Loriene Roy, is now in print! My chapter, “Empowering Indigenous Students in the Learning Library,” describes beginning steps in creating a culturally relevant information literacy program at Diné College. 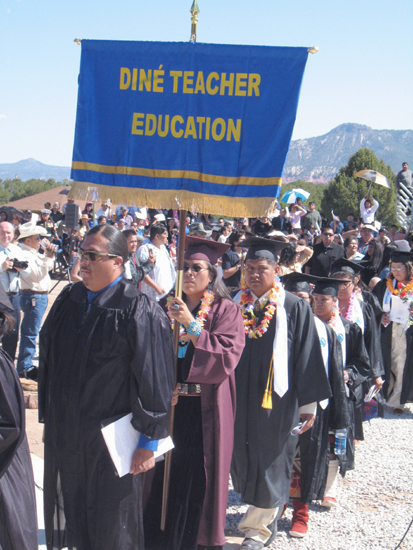 Diné College is the Navajo tribal college, and the first tribal college to be established. In 2008 we celebrated its fortieth anniversary. During my four years there, the Diné College Library made a giant leap across the Digital Divide and into the 21st century—thanks to its visionary leaders, David Hurley (College Librarian) and David Stevick (Shiprock Librarian). They created my job (Instruction/Distance Services Librarian) in order to bridge the daunting distances between the College’s teaching centers in northern Arizona. I drove a circuit of nearly 500 miles (including Tsaile, Window Rock, Ganado, Chinle, Kayenta, and Tuba City) to teach students, faculty, and staff at the distant centers how to use the library online, how to request books to be sent for them to check out at the centers, and how to be digitally literate citizens of the world. At the time, no other tribal college library had a comparable position, so I was breaking new ground. When I arrived, my boss (who was already overextended with overseeing the public, technical, information technology, and building maintenance operations for three libraries located in two states) told me that he could offer me little more than a college vehicle and a map. The rest was up to me. Back in August, I also traveled to Spokane to attend the Pacific Northwest Library Association conference. I went to a number of excellent sessions, including my two favorites, Rachel McDonald’s Digital Storytelling for Children and Teens and The Adolescent Brain, Behavior, and Beyond, by Jennifer Fleck and Jennifer Wooten. The exhibit included full-sized and scale models of many of Leonardo’s inventions (many hands-on) , as well as computer simulations and films. There was also a very funny section on the Mona Lisa in pop culture. The section on Leonardo’s flying machines included the best short film I have ever seen: Leonardo, by Jim Capobianco, which was so enchanting that it brought tears to my eyes. But best of all were the teen interpreters from the Welty Teen Docent program (made possible by Dr. Elizabeth Welty, one of the area’s first female physicians and a longtime philanthropist and MAC supporter). After a competitive selection process, 28 local students aged 14-18 were given an extensive hands-on introduction to Leonardo da Vinci. Stationed at rustic carts in four different areas of the exhibit, the students gave engaging talks on demand about a particular aspect of Leonardo’s work. I discovered by asking questions that they were excited about Leonardo’s work and expansively knowledgeable about every aspect of the exhibit, and happy to offer up many additional fascinating stories. It was inspiring to witness the success of this venture leveraging the energy, brainpower, creativity, and sheer talent of teens for the benefit of the community. Last spring I was at our library’s neighboring elementary school for their family summer reading program kickoff. Jan Delgado from Albuquerque Public Schools was giving a fantastic story time demo, and, while part of my brain was admiring her inventive and very musical approach to early literacy, the other part of my brain kept thinking how much she reminded me of someone I played with in our high school orchestra long ago. To my astonishment, we discovered afterwards that we did indeed go to high school and play in orchestra together in Missouri! Her mother even remembers volunteering with my mother at our elementary school. What a wonderful person to reconnect with! Jan is now part of the Albuquerque school district’s ARTS Center, which offers arts resources, training, and support for the entire school district. She told me that the ARTS Center also serves other local organizations supporting arts, education, and literacy, including the public libraries. So I was able to borrow authentic African instruments for the kids’ puppet show, “The Musicians of Bolgatanga,” which was a real thrill for the performers. On August 27, I attended a half-day workshop on teaching with Orff instruments. Developed by German composer Carl Orff and his colleague Gunild Keetman in the 1920s, it’s a natural and playful approach to teaching music. Its gentle, child-centered activities treat music as a language that every child can learn without formal instruction. Through imitation, exploration, improvisation, and composition, students learn how to solo and how to play in an ensemble without feeling the anxiety associated with being evaluated or judged. They don’t realize how much they are learning while they are playing and exploring. The workshop was taught by Carla Haynes, an elementary school music teacher in Albuquerque, and she really knocked our socks off. I took away a lot of ideas that I want to try out in story times. One Planet, Many Puppets video! My life has been a whirlwind, but that is another story. I’m just now getting around to posting the video I made about the One Planet, Many Puppets workshop that I taught for the summer reading program at the Tony Hillerman Library. A core group of kids stayed on after the puppet-making workshops to come up with a puppet show for the workshop’s grand finale. In just two additional workshop sessions, they brainstormed story ideas, agreed upon a narrative, and worked out how to stage it. 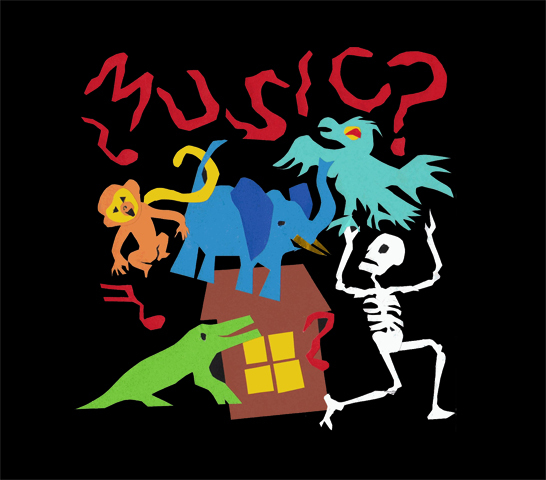 Then, during the final session, they rehearsed and performed “The Musicians of Bolgatanga” — their unique version of “The Bremen Town Musicians” by the brothers Grimm.